The following is a guest post by Rebecca, a graduate of Miami University’s Creative Writing program. She is currently a freelance writer, graphic artist, and will be pursuing a masters in Fashion Design this fall. Like this post? Follow my blog with bloglovin´. Vintage is in. Fashion has come full circle, and with the growing demand for authentic wares and thriving interest in street style, prices are soaring on auction sites. However, the struggling economy has ushered in an era of “inconspicuous” consumption, and not all stores have expressed sympathy for our downsized wallets. For those (like me) who love to update their wardrobe every season but are tight on the green, secondhand shopping can be an untapped resource, a way to fill fashion appetites without breaking the bank. 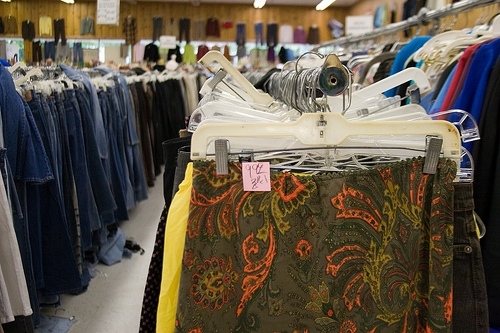 Here are some tips on how to make thrifting work for you. Before stepping through the door, purge your inhibitions. Although the prices are low, buying secondhand is anything but penny-ante. Strict rules accompany all donations, guaranteeing quality control. Extremely few garments have stains/smells (nothing that couldn’t be washed out), and some even have tags still attached. And don’t worry about what your friends will think – it’s nearly impossible to distinguish thrift store-bought clothes from something new, especially when so many retail chains are utilizing the “worn” and “distressed” look. Accept that not everything in a thrift store will be trendy, flattering, or have aesthetic merit. It is, after all, a store full of things people no longer want. But one man’s trash is another man’s treasure, and it’s more important to look for things that reflect your personality and curiosity, rather then trying to find a proxy for the latest trend. If you know how to navigate one, a thrift store can be a potential gold mine – but don’t expect the gold to walk up and introduce itself – you have to be ready to dig. I recommend thrifting if you want to diversify your closet (i.e. nonessentials). But how do you tell if a store is worth going to? To a degree, a thrift store’s inventory comes from its community. Stores will vary in the brands that are represented and in overall organization. There’s no barometer for predicting what you’ll find, but keep location in mind. Stores located in ritzy 50+ neighborhoods (almost like raiding your mother’s closet) will differ drastically from a middle-income neighborhood store. Some of the less established stores don’t research their items (and therefore don’t adjust prices). Personally, I like the bedlam of smaller stores because it feels more rewarding when I find something I like. If you travel a lot, make thrifting a pastime. Big cities almost always have a “hub” with independent boutiques, thrift, and consignment stores. Thrifting is a world apart from retail shopping in its separation from corporate influences. Retail chains structure their “collections” to appeal to the consumerist masses. Posters and mannequins display pre-planned outfits. Every piece is designed to complement another. However, there is no guiding hand behind the racks of Goodwill. The quality of your discoveries is limited only by your imagination. Don’t toss your standards, but try to expand your fashion palette. For example, people ordinarily give up items because they 1) are dated, or 2) no longer fit. This means that if you wear a size M, don’t be afraid to look through the L’s. Clothes shrink (fact of life), and become smaller despite their size tags. Try on anything that catches your eye. Explore your inner style across all aspects of fabric, pattern, and color. If something doesn’t look like a standalone piece, try working it into an outfit. For example, incorporate thin and slinky pieces into an original mix through layering. Because the prices are so low, you can take risks without feeling guilty if it doesn’t work out. In my opinion, a lot of things just look better when they’re worn in. I always keep an eye out for belts and have found two or three where that leather is smooth and broken in, unlike the fake “worn” that stores try to manufacture. Thrift stores have a lot to offer, so don’t gun for the shorts or skirts as soon as you walk in. Take some time to look around (don’t forget the accessories). On the other hand, unless you have hours to spend browsing, go in with a mental checklist of what you’re hoping to find (colors, inspirations) and pick up anything that pops out at you. Here are some questions to ask while you walk: Is it wearable? Does it fit? If not, can it be altered to fit me? What material is it made of? What are the washing directions? (I’ve noticed a lot of dry-clean-only stuff at thrift stores). If you know what you like and what looks good on you, the process will go a lot faster. To find the best stuff, get to know your store! Call in ahead of time and ask when the store restocks its shelves. Also ask about sale days and discounts. Go regularly during these times for the best selection. A lot of clothes in thrift stores look like they’re from Mars. This allows you an enormous amount of latitude to be creative. Because the clothes are cheap, feel free to unleash your experimental side. Cut up (no remorse! ), mix, match, and reinvent to your heart’s content. Tailor clothes to fit you, not the other way around. Try DIY for an individualized look. With some basic sewing skills, you could add personal flair to any garment. For example, if you find a kickin’ screen print on an oversized t-shirt, cut it out and sew it onto something else. You might even have the audacity to whip up your own rendering of a runway favorite. The point is, have fun! Of course you may not feel as “Look-at-me-look-at-me!” in secondhand clothes, but that doesn’t mean you need to feel embarrassed. Take pride in the fact that you took the effort to set yourself apart from the herd. Don’t worry about being judged, especially in college, where most people have grown out of the label-conscious phase. The advantage to thrifting is finding truly unique, one of a kind clothes that reflect your personality and taste. Deign to wear indeed. Thrift stores are not only a way to find great vintage clothes at affordable prices, but also form a bridge between the lavishness of fashion and the rest of the poverty-plagued world. Do you shop at thrift stores? If so, what are your best thrifting tips? Leave ’em in the comments and happy hunting!